Lately, my "craftiness" has slowed a bit. I am doing some studying and trying to get more exercise. Of course, the study involves the creative process and new and/or different methods to do some of the same things I have been doing. I am also doing some handwork or "slow stitching." First up is this piece that I took off the loom a couple of days ago. It was washed (wet-finished), ironed while damp, and I hung it to dry. There is an odd thread/fiber hanging there, but that is not a problem. Once that was off, the loom was empty - but I had a warp already threaded and waiting to hang on the loom. 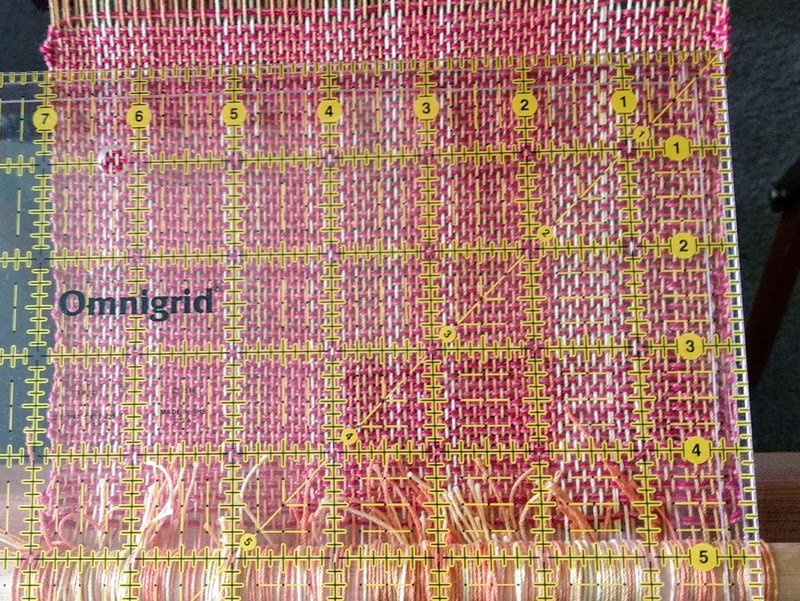 Within 15 minutes, the loom was ready for more weaving. I wove a bit to check it out and see that it was going to work well. 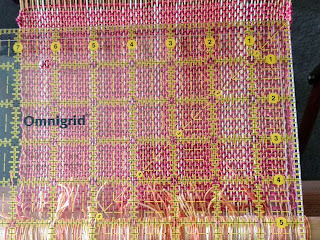 It is weaving up beautifully. 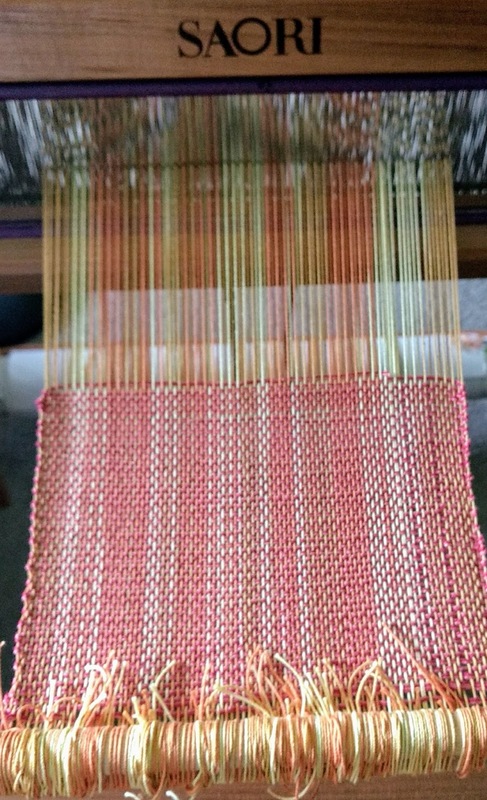 This is a narrow warp that was created to play with matching the color repeats in the variegated yarn. Only moderate success was achieved on this one - but I like the way it looks. It is about 7 inches wide and will certainly shrink a bit when it is wet finished - but less than an inch. The slow stitching I played with was loosely based on some of the study I have been doing. I hope to tell you more about the study later. At least two pair of my blue jeans developed holes in the knees. This is probably because since retirement, I live in jeans. To me, the denim is extremely comfortable. In each pair the hole showed up in the left knee. Clearly, I kneel on that knee much more frequently. A few days ago, I needed to kneel down to check something outside, and "OUCH!" there was a rock under the left knee - right where the hole was. While cleaning and doing some reorganization of fabrics and craft materials (still a mess though) I found pieces of jeans I had cut up to recycle/reuse. One of those pieces became the backing patch for one knee. 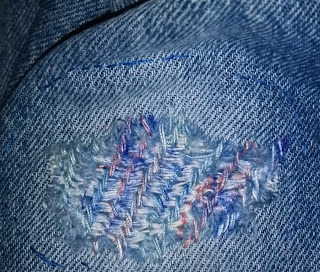 I hand stitched around it behind the hole. Then I found a variegated thicker thread that I used to stitch from the front to reinforce the knee. What I thought was a rust color in the variegation was actually a bit on the pink side. C'est la vie! 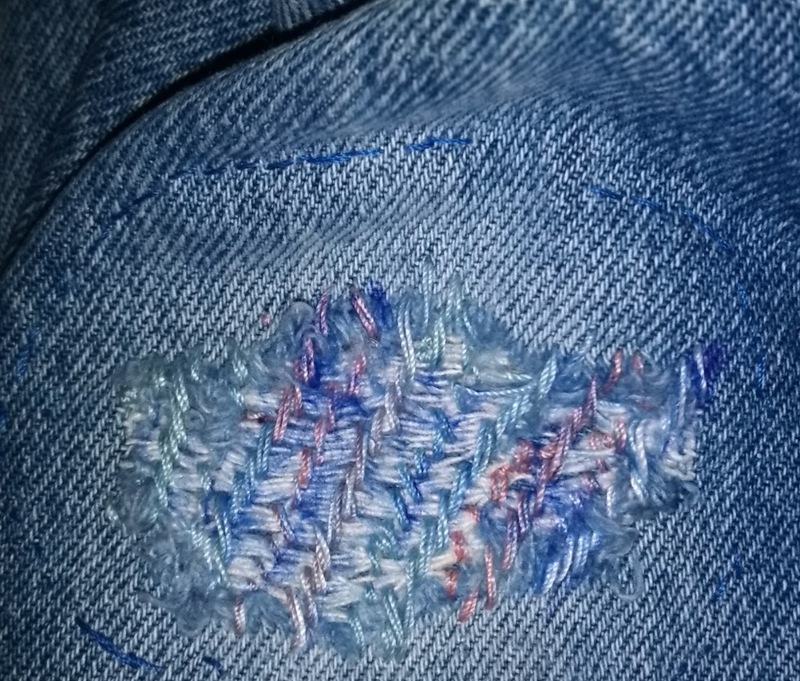 I also used a blue pen to "blend" the patch just a bit. Maybe not a pair of jeans I will wear to an event, but they are absolutely fine for day to day wear. That patch is most likely one of the strongest places on those jeans now. hey, whatever works to get a little more life out a favorite pair of jeans. I've got a pair that needs the crotch reinforced a bit as the frequent washings have worn away the outside stay stitching. One of these days, they'll get some attention but not during shorts wearing season! 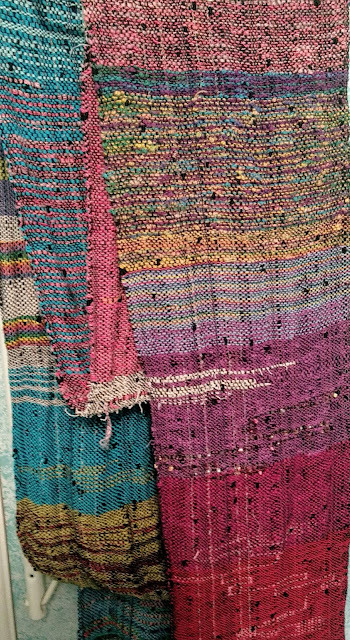 have fun with the weaving! Funny how that happens, same thing with my husband's jeans. A hole develops in the same place in every pair above one knee. We cannot figure it out. Great idea to use to patch it, plus some more artistry that makes it look better. Love your inventiveness for the jeans. We all hate to give up the worn soft ones. A well-worn pair of jeans is a treasure at my house...I just need to stop GROWING out of them! Your patch was another genius idea! love your "patch" wear it with pride!